Happy Friday, everyone! 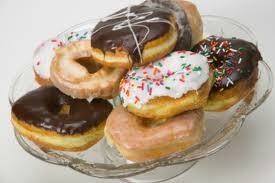 Would anyone care for a donut? I’ve been trying to resist posting today’s Perfect Picture Book for a while because it is out of print. But it is one of my all time favorite books ever, and since I got notification this week that one of my books is going out of print, I thought this would be a nice time to celebrate books that don’t always get as much recognition as one might hope. This is a story my parents read to me, and that I read to my kids. It was always a favorite in our house. I hope you’ll be able to find a copy at your local library, or get a used one through some channel or other. It’s really wonderful! Opening: “The forest was dark and very quiet. Even the wind had stopped breathing. Not a leaf was falling, not a blade of grass was moving. And do you know why this was so? Brief Synopsis: A very beautiful camel goes for a walk in the forest. Unbeknownst to her, a tiger waits hidden “by leaves, flowers, vines and grasses. He was hidden also by the darkness.” But the tiger is not the only one waiting and watching. Each of the creatures hidden in the forest has its own secret plan. What will happen to the very beautiful camel? Links To Resources: Camel Coloring Pages, Tiger Coloring Pages, Monkey Coloring Pages, discuss cause and effect, read other books where one thing leads to another, like If You Give A Pig A Pancake or Stuck. Isn’t is beautiful? But aside from the exquisite language, I love the way the book builds tension. The camel approaches the hidden tiger. She comes closer… and closer… and you just have to wonder, how will she get out of this? The ending is deliciously unexpected! Phyllis is still traveling – I hope you’ve all had a chance to keep up! There should be posts from North Carolina and Italy, and maybe another from St, Lucia coming up soon! For those of you interested in Would You Read It (or simply in learning how to write a good pitch) there was an excellent post on Cheryl’s blog: How To Pitch Your Book. The post uses a novel as an example, but it can easily be applied to picture books. If you follow the basics rules, it will help you come up with a beautiful 3 sentence pitch. Just right! And as for NaPiBoWriWee, I’m happy to report that I’m technically ahead of schedule since as of this writing (on Thursday evening) I have already completed 4 PBs (which means I’m up-to-date until bedtime Saturday when I should have a fifth… which heaven knows how I will get written Saturday… Sunday either… hmm… maybe I’d better stay up a little longer!) But RIGHT THIS SECOND, I’m ahead of the curve! Now off you go to hop around the blogosphere and see all the Perfect Picture Books posted today. PPB bloggers, please add your post-specific link to the list below. April Pitch Pick and Oh Susanna – Can I Acquire Illustrations To Help An Editor Understand My Intent? J'aime Duvoisin! nHad never seen this one and have it on hold already! 🙂 When I was a kid my brother told me gullible wasn't in the dictionary and I ran to prove him wrong! I'm definitely check out the pitch how to link!!! Oh, I'm so glad someone else knows it! Isn't it just delightful? Oh Susanna! A sprained pancreas? Goodness me, glad to hear you're on the mend! 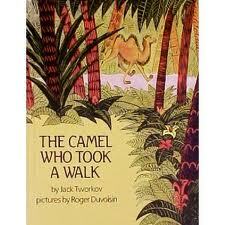 And THE CAMEL WHO TOOK A WALK sounds like a fun and tense read for children! I discovered this book last year. Intrigued by the author's name Jack Tworkov, a name familiar to modern painters. if it's the same Tworkov he was one of the Abstract Expressionists, who forged a new frontier for American painting in the 1950's and 60's. Like the illustrator Roger Duvoisin Tworkov was an immigrant who made an outstanding contribution. Duvoisin had a great career as an author illustrator http://eclipse.rutgers.edu/goose/zam/duvbio.aspx. But after a bit of research it remains hard to know if the Jack Tworkov who wrote The Camel who Took a Walk is the same Jack Tworkov who American Painters continue to thank for his contributions to the field of art, today. How interesting, Susan. Thanks for sharing with us!